(CNN) - At least 20 people have died as a result of the mudslides that devastated Montecito, California, according to the California Department of Fire and Forestry Protection. The Santa Barbara County Sheriff's Office announced Sunday that 30-year-old Pinit Sutthithepa had been found dead on Saturday. Four people remain missing. Sutthithepa's 2-year-old daughter, Lydia, is among the missing, the sheriff's office said. Sutthithepa's 6-year-old son, Peerawat, and his 79-year-old father-in-law, Richard Loring Taylor, were both found dead on January 9. 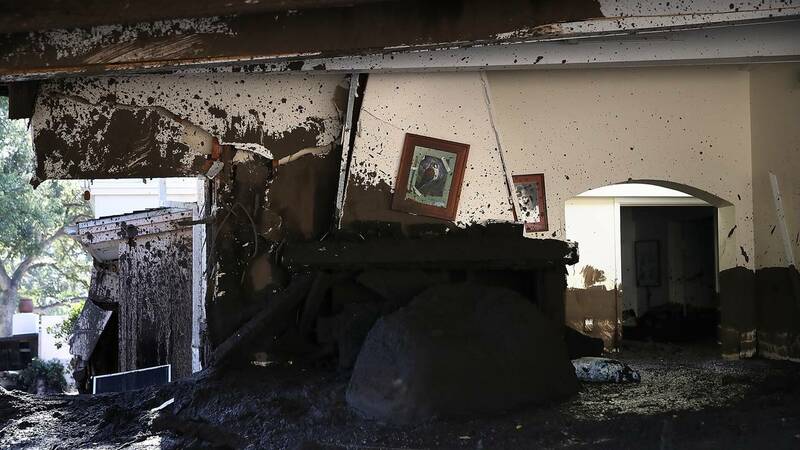 The mudslides came in the early morning hours of Tuesday, destroying an estimated 65 homes and damaging hundreds of others, the Cal Fire release said. Rescue crews continue to sift through mud and wreckage looking for the missing, said Cal Fire, adding, "The large amounts of mud and debris are making access and progress challenging." Santa Barbara County Sheriff Bill Brown announced Saturday that search and rescue crews had found the body of 25-year-old Morgan Corey, whose 12-year-old sister, Sawyer, was found dead earlier in the week. Those killed ranged in age from 3 to 89, and all lived in Montecito in Santa Barbara County, northwest of Los Angeles, authorities said. In addition to Lydia Sutthithepa, John "Jack" Cantin, 17; Faviola Benitez Calderon, 28; and John "Jack" Keating, 53 are missing. Sunday night the sheriff's office said the search-and-rescue operation is now a search-and-recovery effort. Rescuers have been searching frantically for the missing since rivers of mud and boulders plowed through neighborhoods in and near Montecito, an affluent seaside community east of Santa Barbara, demolishing homes and leaving roads impassable. "In disaster circumstances, there have been many miraculous stories of people lasting many days. We certainly are searching for a miracle right now," Brown said Thursday. "But realistically we suspect that we are going to continue to have discovery of people who were killed in this incident." US 101, a major freeway connecting Northern and Southern California, remains closed. It's not clear when the highway -- which officials had said would reopen on Monday -- will be cleared for travel. The exact timing of the freeway's reopening is unknown, California Highway Patrol Captain Cindy Pontes said Friday. The areas where people were killed are under mandatory evacuation, and officials increased the size of the evacuation zone Thursday as authorities continue their search and rescue efforts. "We know that this a terribly inconvenient development, but it is also incredibly necessary," Brown said. "This entire area is a very active rescue and recovery and repair zone right now." The zone, which includes areas formerly under voluntary evacuation advisories, will be in effect for one week but residents should plan for two, Brown said. There's also the issue of removing massive boulders that have been strewn throughout the area. Todd Ferryman, superintendent of Access Limited Construction, and his men have been drilling holes into boulders. Crews will drop a nontoxic, biodegradable "expansion agent" that will break down the boulders into more manageable sizes. "It's kind of like putting water in a rock and freezing it," Ferryman said. "It expands up and it cracks the rock." Ferryman and his crew will be working seven days a week until the area has been cleared, he said. "There's a lot of people out here that haven't been able to get to their homes yet and see them," he said. "So the sooner we get this open and safe for the public, the sooner we can get everybody back to their lives." Montecito may be at slightly less risk now, because this week's flooding already brought down vulnerable material. "(But) no storm brings down everything that is susceptible. There's almost always more" that could come down, Jibson said. What can be done? One long-term option would be to build more basins to slow down storm runoff and collect debris. Montecito and Carpinteria are especially vulnerable to mudslides because their steep terrain in some places goes from thousands of feet above sea level to the ocean in just a few miles, said Tom Fayram, a deputy public works director with Santa Barbara County.